The Hollywood Swank is designed for your personal use and bedroom setting. Don't worry, the Hollywood Swank will be there to satisfy your needs right before going to bed and in the early bright morning. Wake up and go to sleep with the Hollywood Swank by your side. 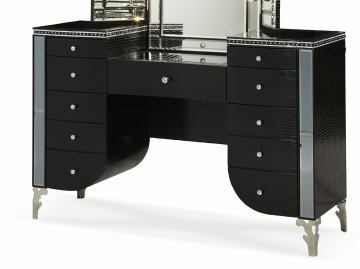 do u have this dresser in black wood, i love this design. but i dont prefer the iguana? Best Answer: Yes we have a dresser in the same color, here is the link to it below. does the big mirror come with the whole vanity desk? Best Answer: Mirror is sold separately. This Hollywood Swank Collection item features a video. Many furniture brands ask that we do not show our low prices for their products online. To learn about these prices, please fill out the form below, or call us at (212) 518-2752. As always, we will ensure the privacy of your information. Shipping charges vary by location; we need your ZIP code to provide an accurate quote. Your submission has been received by our staff. One of our team members will be contacting you shortly.